The Leopard Cat (Prionailurus bengalensis) is a small felid species with a range spanning India to the Far East of Russia and Indochina. It is a solitary animal, living mostly in tropical evergreen forests. One of our field researchers was lucky enough to spot one crossing the road here at Sakaerat SERS recently. Leopard Cats hunt at night, and feed mainly on prey such as small mammals, lizards and birds as well as large insects. Here in Sakaerat Biosphere Reserve they share their environment with the Asian Golden Cat (Catopuma temminckii) which is larger and able to predate even on deer species, therefore direct competition is rare. (Not) Fun fact: The Leopard Cat has been mated with domestic cats since the ‘60s to produce hybrid offspring known as the Bengal cat. Since these hybrids are often sterile, the demand for pure Leopard Cats is high and the species continues to be hunted throughout most of its range for fur, food, and as pets. This image shows a Leopard Cat in front of the shelter of a radiotracked Monocled Cobra (Naja kaouthia). Our work focuses on the spatial ecology of the Monocled and Indochinese Spitting Cobra. Our field assistants track the snakes and gather data on the micro-habitats that are utilized. As such, on rare occasions, we will have a visual and witness the snakes (and their behaviour) in their natural environment. We aim to disturb the snakes as little as possible and great care is taken during data gathering to achieve this. 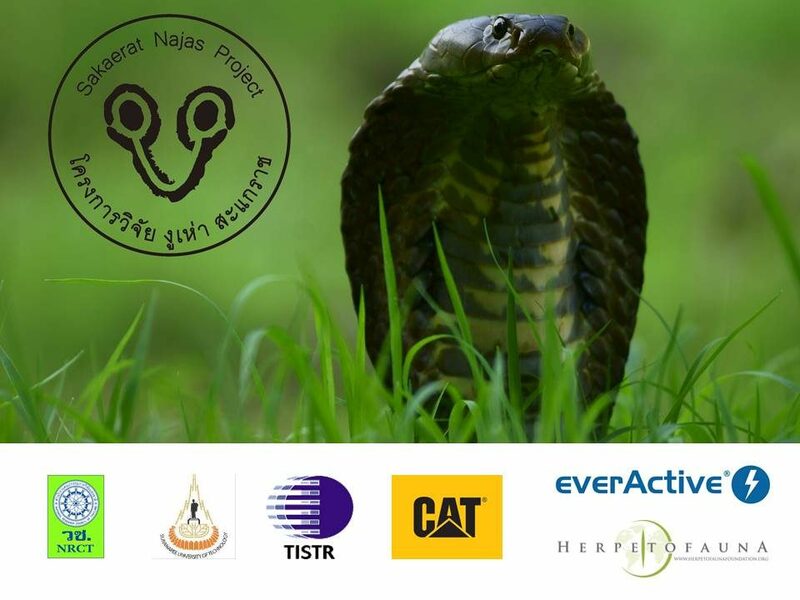 Just yesterday, our tracker Lichy Pulman was locating our longest tracked Monocled Cobra: NAKA012. Through use of radiotelemetry, the snake appeared to be stationery within the Dry Dipterocarp Forest. Once carefully and slowly located, the snake was found basking on an outcrop of stone within the forest. Once spotted, our tracker monitored from 10 meters until the snake started to move in his direction. Movement was therefore necessary resulting in the snake sensing human presence. Although not visibly panicked, NAKA012 turned slowly and repositioned 20m away. The video was captured on a mobile phone, therefore the quality is not great, but the content is superb. Camera Traps….a vital tool used in the research carried out by the Najas Project. To study snake behaviour within their chosen habitats our field researchers place devices in situ and analyse images to collect data. Camera traps are set up on timelapse mode. Unfortunately ‘PIR ‘(movement detection) is not effective for documenting cold blooded animals, however, timelapse allows us get an insight into the lives of these secretive animals. Attached is a female Naja kaouthia who on this occasion inhabited a termite mound. Our camera traps last for approximately three days post-placement, therefore, unsurprisingly we also capture images of the vast amount fauna within Sakaerat Biosphere Reserve. Every Saturday – ‘Spotted Saturday’s’ – we will present these interesting and sometimes amusing images. On 25th April 2016 Tyler organized surve for group of students that visited Sakaerat Environmental Research Station . They were lucky to find Naja kaouthia! Male was 942 g and 1.5 m. Snake was implanted and now is part of our project. Photo credit to R. Maki and M. Hogan.